The most important tool in business is a handshake. It symbolizes a friendly introduction to our company or a job well done. We pride ourselves on our higher standards of customer service. It is important to us that your needs are not only met, but exceeded. In today's competitive market place, exemplary client relations is what brings our clients back time and time again. 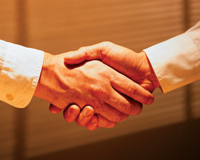 We want to make the process of doing business with us as easy as possible. Just select your destination from the provided links on the left to get started.